NoClone is a shareware, only limited duplicate files (i.e. 300,000 files) will be compared if you haven't bought it yet. To buy a copy, you can pay it through our agents, PayPal, ShareIt and RegNow. Please visit our website to BUY NoClone online. You can get registration code instantly. ShareIt: US Tel. : +1-952-6465747 or +1-800-9034152. Germany +49-(0)221-3108820. Please include product ID 188523 (Home ed) or 202302 (Enterprise ed). RegNow : Toll Free phone no. in the US +1-877-3537297. Internationally, +1-952-6465331. Available 24 hours per day, 7 days a week. Please include the product ID 8924-1 (Home ed) or 8924-5 (Enterprise ed). Please email reference no. in T/T and preferred user name to cs@noclone.net for registration. 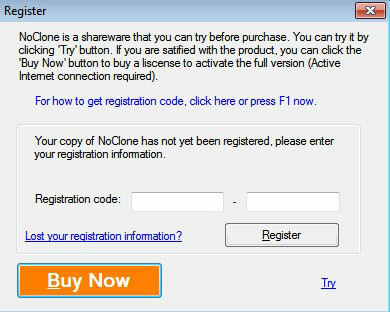 Once you bought a copy of NoClone, we will email you a registration code. Please enter your user name and registration code when NoClone started. The registration screen can be displayed by select Registration > Register.